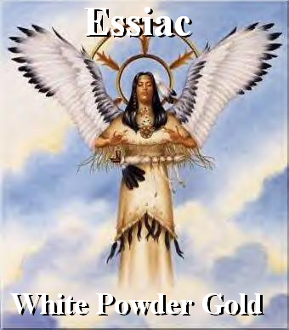 For this I made the Essiac tea, which is a Native American 8 herb blend, then preformed the John Hudson WPG Method to concentrate it into White Powder Gold. 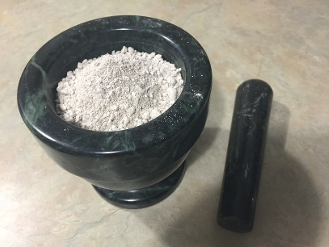 When I made this I received 3 times as much precip as I would with only dolomite lime alone like with basic WPG so needless to say this stuff is loaded with goodies. It is thought that Essiac tea was used by Native Americans for the purpose of treating various maladies. Rene Caisse, a nurse, was given this formula by a patient who was using it to treat their own cancer. The eight herb formula Rene Caisse revealed contained: Burdock Root, Blessed Thistle, Kelp, Red Clover, Sheep Sorrel, Slippery Elm Bark, Turkish Rhubarb Root, and Watercress. This is the most effective form of Essiac tea available and this is what we provide. Traditional therapy such as chemotherapy kills the cancer cells, but it also kills good cells since it cannot differentiate between the two. This, in turn, can make the body weaker. This tea is designed to not only deplete the body of the toxins which are causing illness, but also boost the immune system making the body stronger, therefore, more able to fight disease. Prevent the build up of excess fatty deposits in artery walls, heart, the kidney and the liver. Regulates cholesterol levels by transforming sugars and fat into energy. Counteracts the harmful effects of aluminum, lead and mercury poisoning that can cause illness and disease. Helps bones, joints, ligaments, lungs and membranes remain strong and flexible, more durable and less vulnerable to stress. Promotes the absorption of fluids in the body tissues. Removes toxic accumulations in the fat, lymph, bone marrow, bladder and alimentary canal. Neutralizes acids, absorbs toxins in the bowel and helps eliminate both. Blessed Thistle is used for digestive problems such as gas, constipation and upset stomach. This herb is also used to treat liver and gallbladder diseases. Burdock Root is a mild diuretic. It increases the production of both urine and sweat, potentially making it useful in treating swelling and fever. Burdock Root might play a role in preventing liver damage caused by alcohol, chemicals or medications. The exact reason for this protective effect is not known, but it is thought to involve opposition of a chemical process called oxidation, which is a reaction that occurs in the body during normal metabolism. One result of oxidation is the release of free radicals, which are chemicals that may suppress immune function and have been linked with cancer. Antioxidants such as Burdock Root may protect body cells from damage caused by oxidation. Kelp is a sea vegetable that is a concentrated source of minerals, including iodine, potassium, magnesium, calcium, andiron. Kelp as a source of iodine assists in making thyroid hormones, which are necessary for maintaining normal metabolism in all cells of the body. This increases energy levels, boosts the immune system and makes it easier to maintain a healthy body weight. Red Clover is a source of many valuable nutrients, including calcium, chromium, magnesium, niacin, phosphorous, potassium, thiamine and Vitamin C. Red Clover is also a rich source of isoflavones, which are water-soluble chemicals that act like estrogens in the body. The isoflavones isolated from Red Clover have been studied for their effectiveness in treating some forms of cancer. It is thought that the isoflavones prevent the proliferation of cancer cells and that they may even destroy some cancer cells. Sheep Sorrel contains an abundance of oxalic acid, sodium, potassium, iron, manganese, phosphorous, Beta Carotene and Vitamin C. Sheep Sorrel is a mild diuretic, mild antiseptic and a mild laxative. These properties make Sheep Sorrel useful for ridding the body of toxins. Slippery Elm Bark has been used as a poultice for cuts and bruises, and also for treating aching joints due to gout, arthritis or other causes. This herb also helps to alleviate sore throats. Slippery Elm Bark is an active ingredient in throat lozenges. Since sore throat and cough are often linked, Slippery Elm Bark has also been used in cough remedies. It also can alleviate both constipation and diarrhea by regulating the digestive tract. Turkish Rhubarb Root is a detoxifying herb and is world famous for its healing properties. Turkish Rhubarb Root purges the body of bile, parasites and stagnated food by stimulating the gall duct to expel toxic waste matter. It has been shown to alleviate chronic liver problems by cleansing the liver. Turkish Rhubarb root improves digestion and increases the appetite for healthful foods. It has also been shown to help heal ulcers, alleviate disorders of the spleen and colon, relieve constipation and help heal hemorrhoids and bleeding in the upper digestive tract. Watercress is abundant in Vitamin C and is used as a general tonic; its bitter taste is thought to stimulate the appetite and improve digestion. It can be used to alleviate nervous conditions, constipation, and liver disorders. Watercress is a popular cough and bronchitis remedy. It contains a remarkable substance called rhein, which appears to inhibit the growth of pathogenic bacteria in the intestines. It is believed that rhein is also effective against Candida Albicans (yeast), fever, inflammation and pain. It is thought that Essiac tea was used by Native Americans for the purpose of treating various maladies. Rene Caisse, a nurse, was given this formula by one of her patients who was using it to treat her own cancer. Although her cancer was cured, this version of the formula did not help a good many others who tried it. After many years of research, doctors eventually developed an injectable version of the formula which proved to work better. All of this information has been documented in testimonials written by Rene Caisse as well as signed papers by staff physicians. After several attempts by Rene Caisse and Dr. Brusch’s brother to get permission for doctors to inject the authentic formula, the Canadian Government denied their requests. The Canadian Ministry of Health had strict rules regarding injectable medications. Rene Caisse refused to give up. In 1959, she and Dr. Charles Brusch of the Brusch Medical Center in Cambridge, Massachusetts set out to create and oral version to be taken in tea form, since there were fewer government regulations for this form. The four herb formula was never meant to be taken orally. Rene Caisse Signs Rights over to Resperin Corp. In 1977, Rene Caisse signed over a four herb formula to Resperin Corp. of Canada under the agreement that Resperin would complete clinical tests on the formula. If the contract was breached, sole rights of the formula would be handed over to Dr. Charles Brusch, who had already performed clinical tests with Rene Caisse. It turns out that Resperin breached the contract by never completing the tests, but the formula still remained with them. After further research, an oral tea formula was developed that contained eight herbs, including the four herbs from the formula that was designed to be injected. Exclusive rights to the formula were left to Dr. Charles Brusch in 1977 (a year prior to Rene Caisse's death). This formula was proven to be the most effective formula to date. The eight herb formula Rene Caisse revealed to Dr. Charles Brusch contained: Burdock Root, Blessed Thistle, Kelp, Red Clover, Sheep Sorrel, Slippery Elm Bark, Turkish Rhubarb Root, and Watercress. Brusch performed eight years of clinical research on this oral form of tea. He even took it himself when he fell ill with cancer. Brusch made the claim that this eight herb tea alone cured his cancer. Although Dr. Brusch and Caisse experimented with other forms of Essiac such as tablets and tinctures, nothing proved as effective as the tea form (sometimes referred to as the juice form). Rene Caisse passed away in 1978, and Dr. Brusch passed away in 1993. The eight herb formula that was found to be superior in the Brusch clinical trials is the most effective form of Essiac tea available and THIS is what we provide. Essiac and cancer has been the topic of a great deal of discussion over the last several years. It has been noted by thousands of individuals worldwide that their recovery and overall health regarding cancer has been remarkable following a specific regime of Essiac tea. Thousands of testimonials do not lie. Traditional therapy such as chemotherapy kills the cancer cells, but it also kills good cells since it cannot differentiate between the two. This, in turn, can make the body weaker. This tea is designed to not only deplete the body of the toxins which are causing illness, but also boost the immune system making the body stronger, therefore, more able to fight disease. We do not claim that Essiac Tea will cure a particular disease. However, the following list of illnesses and diseases may benefit from a reduction of toxins in the body and an improved immune system, and it has been proven that the herbs in this tea reduce levels of toxins and improve the immune system.